Goggomobil was the brand name for a line of cars made by Glas, a small German automaker active in the 1950s and 1960s. Glas was eventually absorbed by BMW in 1966, but cars were still produced under the Goggomobil nameplate until 1969. 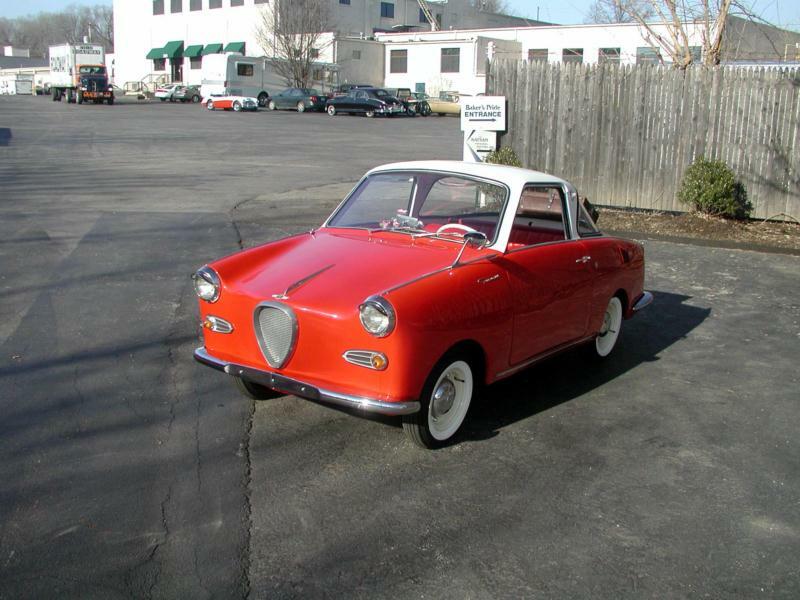 Goggomobil cars were imported into the United States by Continental Car Combine in New York City from 1955 to 1961. The basic Goggomobil platform was a unibody chassis stamped from steel and welded with a central tube and diagonal ribs for support. Goggomobil cars were first built in a variety of forms, including a two-door sedan called the T300 and a two-door coupe called the TS, which was sold as the TS250, TS300 and TS400. German buyers could also purchase a van with sliding side doors and double doors in the rear, and a two-door pickup truck. There was also a T250 sedan that featured a smaller engine that was not imported to the United States. The engine in the 1955-1957 Goggomobil was an air-cooled 296 cc parallel twin cylinder two-stroke, rated at 17 hp. The transmission was a 4-speed manual. 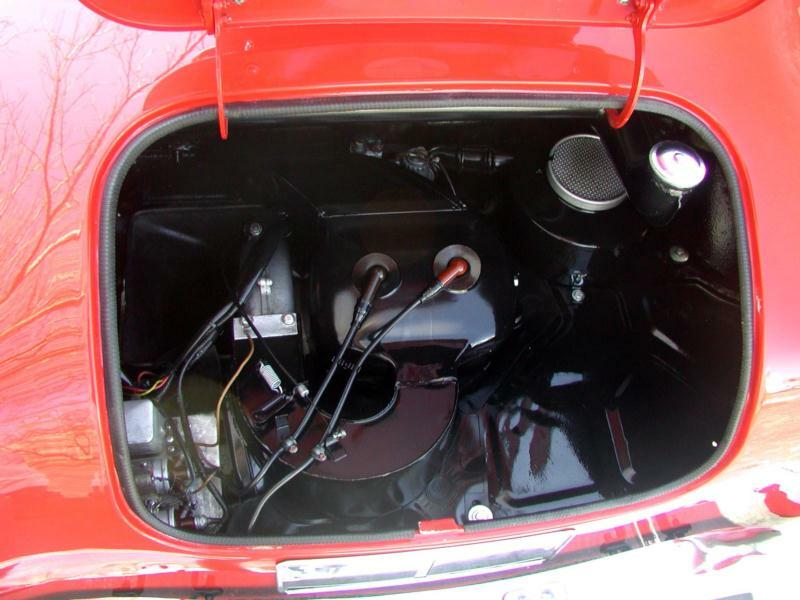 The engine and transmission were a single unit mounted in the rear of the car, and driving the rear wheels by means of a swing axle rear suspension suspended on coil springs. The front suspension was also swing axle with coil springs. Braking came courtesy of four-wheel hydraulic drums, and the Goggomobil featured rack and pinion steering. The price of the first generation T300 was $995, and the TS300 coupe sold for $1,395. 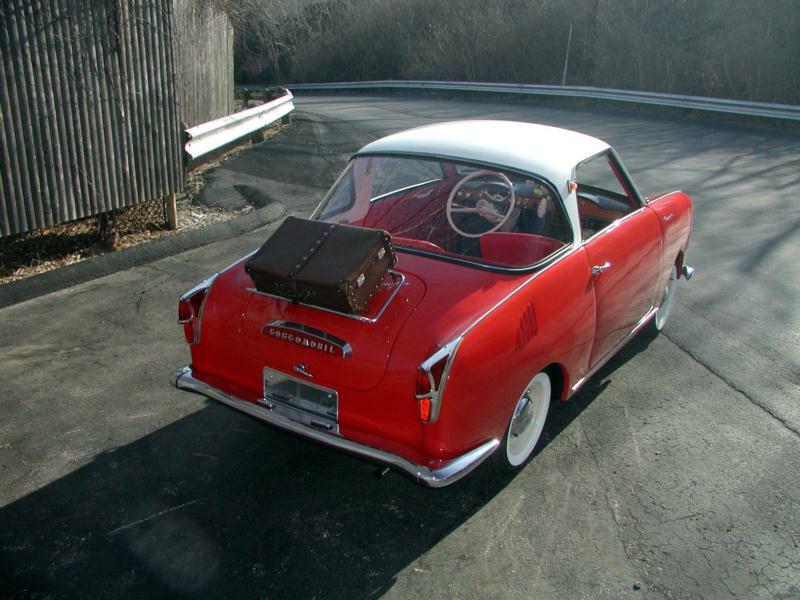 Goggomobil claimed the cars could reach 60 mph, with up to 48 mpg fuel economy. 0-60 time was 29.8 seconds. 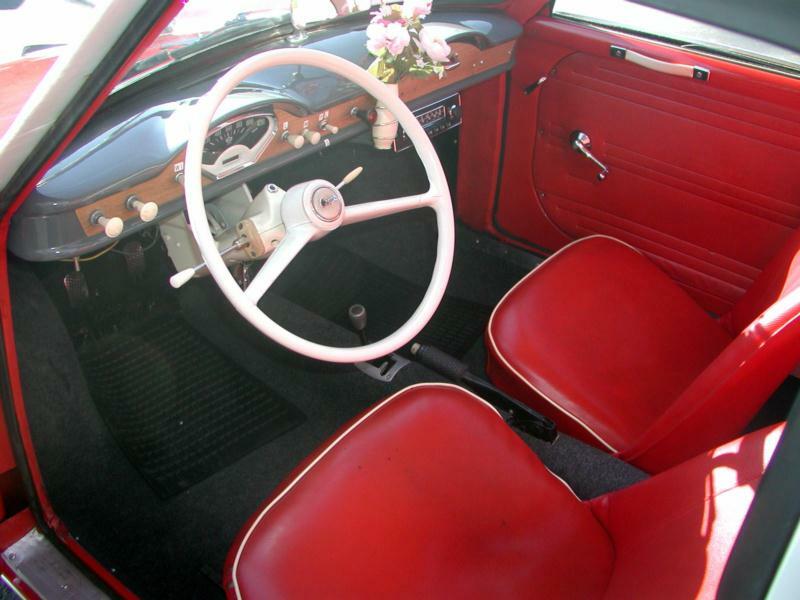 The available options were a preselector transmission and a sliding canvas sunroof. For 1958, Goggomobil updated the engine to 392 cc and 20 hp. The new models were called the T400 for the sedan and TS400 for the coupe, respectively. The new engine used an oil reservoir to mix its two-stroke oil, relieving the owner of the need to add oil at every fill-up. The old 296 cc engine could still be ordered, however. With the new engine, the cars had about the same top speed and acceleration, but got up to 60 mpg. In 1959, Goggomobil introduced the new T700 Royal sedan. This car was based on the same basic platform, with some visual differences in the headlights and taillights, and mounting the engine at the front of the vehicle in a traditional front engine, rear drive configuration. The new engine was an air-cooled horizontally opposed two-cylinder, four-cycle engine displacing 682 cc and making 30 hp. The T700 also used an updated coil spring front suspension, and a laminated rear spring with swing axles. Top speed for the T700 was 70 mph, and fuel economy remained high at 60 mpg. For the final two years of importation, the T400 and T700 series were both available, and the T700 line expanded to include a roadster and a coupe. The T400 also gained a roadster in this era. Prices ranged from $995 for a T400 sedan to $1,695 for a T700 Sprint Coupe. Some of the rarest Goggomobils were produced in Australia, where the distributor was building the cars under license. Buckle Motors Pty Ltd created the Goggomobil Dart as a fiberglass-bodied doorless roadster based on the T300 and T400 models. Some 700 of these were built, but none were formally imported into the United States. Goggomobil production continued for the German market through 1969, with a total of over 280,000 cars built. 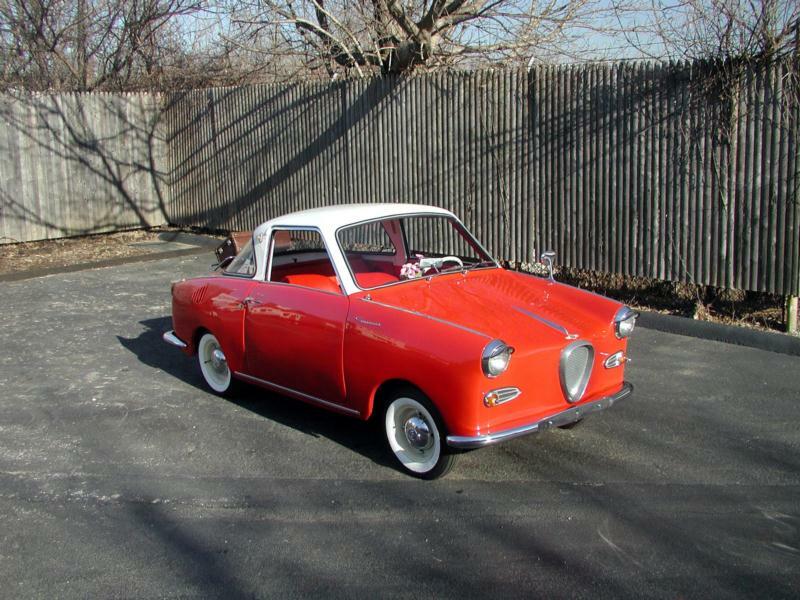 Collectors of microcars will prize any Goggomobil, but the rare Dart would be the most exciting find. With high production numbers over a 14-year life cycle, it should be possible to find a Goggomobil in good condition, but you might have to search in Europe to find the best deal.